Experts say that preparation and practice is the key to a successful flight. Here are seven tips for making your child feel as comfortable as possible. MiniTime is the first family travel site with personalized recommendations based on the ages of your kids. National Autism Awareness Month is coming to a close just as summer vacation-planning gets underway. For families with children on the autism spectrum, taking a vacation can bring a sense of dread. Autistic kids do best with structure and routine, and a vacation--by definition--is a break from that. Few of us would describe flying with kids as particularly enjoyable or stress-free. Yet for parents of kids with autism, air travel means navigating a string of intimidating experiences, from airport security procedures, moving sidewalks, and boarding tunnels to cramped seats, unfamiliar noises, and a multitude of strangers. Start with a baby step. Make your child's first flight a short one, if possible, with no more than an hour or so in the air. Prepare your child. In the weeks leading up to your trip, begin a dialogue with your child about what will happen on your trip. Go over the travel process in detail: how you'll get to the airport, wait in line, go through security, find your departure gate, get on the plane, buckle seatbelts, and spend time onboard. It can be helpful to read children's books that describe the sensations of air travel, such as The Noisy Airplane Ride by Mike Downs. Take a practice run. Call your airport and ask if there is an autism access program in place. Many will let families take a practice run through airport security. 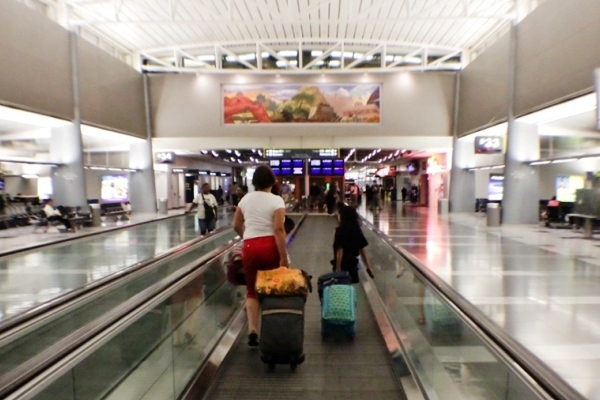 Washington Dulles, Boston Logan, Philadelphia International, and Atlanta are among a growing number of airports that offer parents and autistic kids deeper familiarization experiences such as mock boarding. Raise your hand. Let your airline know as far in advance as possible that you'll be flying with a child with autism. Request bulkhead seats, which feel less confining and eliminate the possibility of seat-kicking. Three days before your trip, call the Transportation Security Administration's hot line, TSA Cares (855/787-2227; open Mon-Fri, 9am-9pm EST), which can act as an intermediary with airport customer care and help you navigate security checkpoints. Consider meals and snacks. If you're taking a long flight, ask your airline if food will be served. If so, consider requesting a special meal, such as the gluten-free option. Alternatively you can bring food from home or purchase items at the airport after you pass through security. Ask for priority boarding. Notify your airline in advance that you'd like to pre-board and, just to be safe, arrive at the departure gate early and make the request again. Boarding early will give you the chance to get your child settled and comfortable before the stream of passengers begins. Pack essentials. Carry documentation of your child's diagnosis, in case airport or airline staff request it. Pack any item that might be soothing to your child during a rough patch. If your child is sensitive to loud sounds, bring noise-cancelling headphones. Consider multiple ways for your child to stay occupied during the flight, and come armed with extra books, toys, DVDs, and electronic recharging accessories. Pack a change of clothes in case of spills. --Margalit Sturm Francus of AutisticGlobetrotting.com contributed this to MiniTime.com.